This one is for all the football fans! 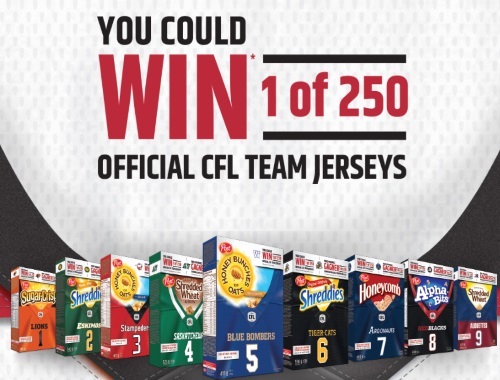 Win a CFL Jersey instantly when you enter PIN codes from specially marked Post Cereals! There are 250 official Jerseys available to be won (size large), approximate value of $200 each. Discount code prizes redeemable at www.CFLshop.ca, available: 970,900 10% discount; 346,750 15% discount; 55,480 30% discount; 13,870 50% discount. Odds of instantly winning depend on number and timing of eligible entries. Limit of one (1) entry per unique pin number.